During our families Carnival Liberty family cruise, we planned to have a day in Nassau, Bahamas. We have visited here many times and done the traditional tours and excursions. For this cruise, I wanted to do something unique and different. As our sailing date approached, I looked at every Nassau, Bahamas Hotel offering a Day Pass. Many of the resorts had great offerings but, were Adult-Only or didn’t allow kids under the age of sixteen. Since this was our family cruise, the choices soon became easier. So we chose the British Colonial Hilton which primarily hosts business travelers and offered a quiet, relaxing experience that was perfect for families. We booked our Day Passes at the British Colonial Hilton through a third-party website at ResortForADay.com. Once you place your order, the hotel will reserve your day passes for your visit. The hotel only sells a limited amount of passes, to help maintain a great experience for all guests. The Day Passes for Adult’s cost $79 and Children ages 6-12 costs $39. Children 5 and under play and eat FREE. When booking this, you are only charged a deposit of $17 for Adults and $6 for Children. On the day you arrive at the hotel, you will pay the balance of $62 for Adults and $33 for Children at the Front Desk. Once checked-in you’re given a wristband, and they apply a food and beverage credit to your account. TIP: If you have a Hilton Honors account you can ask for the Wi-Fi Password and get FREE Wi-Fi! It works great on the beach and pool area. If you don’t have a Hilton Honors account, you can buy wifi for the day for $10.99 when you check-in. Guests can arrive as early as 9 AM. Guests are invited to stay in the outdoor pool/beach area until sunset. However, the outdoor pool, restaurant & bar staff leave at 5 PM. This resort stood out because so many things are included. The great reviews also helped make it an easy choice. The British Colonial Hilton is only a short 10-minute walk from the cruise ship terminal. 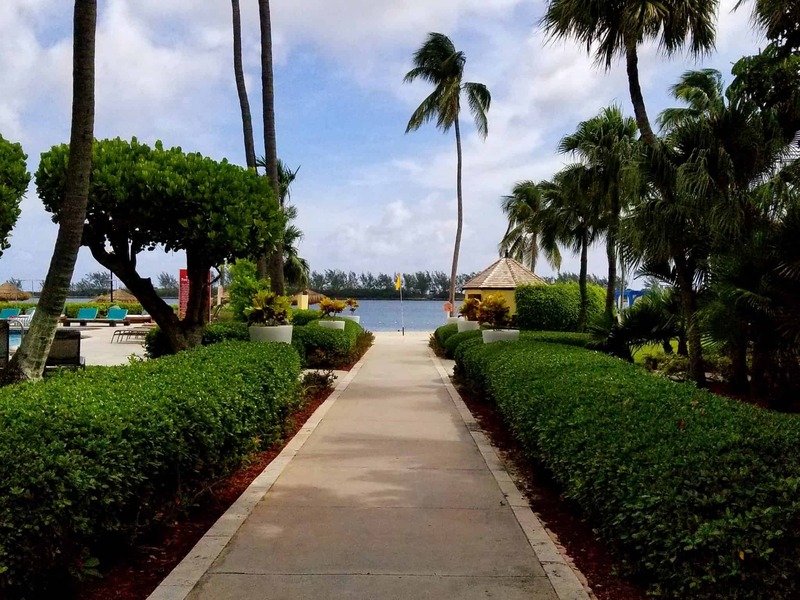 When you exit the cruise dock, you would make a right-hand turn and just follow the roadway to its end where you would see Senor Frogs Restaurant, just turn and follow to the front of the building to the entrance of the British Colonial Hilton. If you would prefer to catch a taxi, the price is $9.00 based on two and $3.00 for each additional person. The taxi ride is also 10 minutes away from the hotel. We chose to walk during our visit, and it was easy to do. You walk right by the straw market, shops and of course Senor Frogs Restaurant. So you have a chance to eat, shop or stop along the way to extend your day before or after your visit. This historic hotel location dates back to 1901 as the Colonial Hotel. It has changed names and brand’s but, is a real jewel of the Bahamas. It was used as a filming location for not one, but two James Bond films Thunderball (1965) and Never Say Never Again (1983 unofficial remake). Both of these movies Starred one of my favorite lead actor’s, Sean Connery. During our stay, everyone was accommodating and friendly. We found the hotel grounds clean and inviting. We arrived early and had our choice of a shaded lounge chair and table by the beach. Later on, we jumped in the pool and cooled off. TIP: If a shaded spot is a must, you should plan to arrive early to have a good choice of shaded seating on the beach or around the pool. Before long we were ready for Lunch and ordered Jerk Chicken Legs, A Steakhouse Burger, and Hotdog meal. Each meal came with fries and a side salad. Me and my wife order some cold drinks. The food was excellent, and the portions exceeded our expectations. The whole experience was fantastic. The hotel and grounds are simply beautiful. Later in the day, we returned to the ship and on the way back purchased a few Bahamas t-shirts for the girls. We got back on board around 3 pm.